Compatible with your VIP E Cig Starter Kit, each five pack of VIP cartridge refills ensures you never run out of your favourite flavours. Designed with menthol cigarette fans in mind, this strong and icy Double Menthol flavour delivers the equivalent of 40 cigarettes per cartridge. 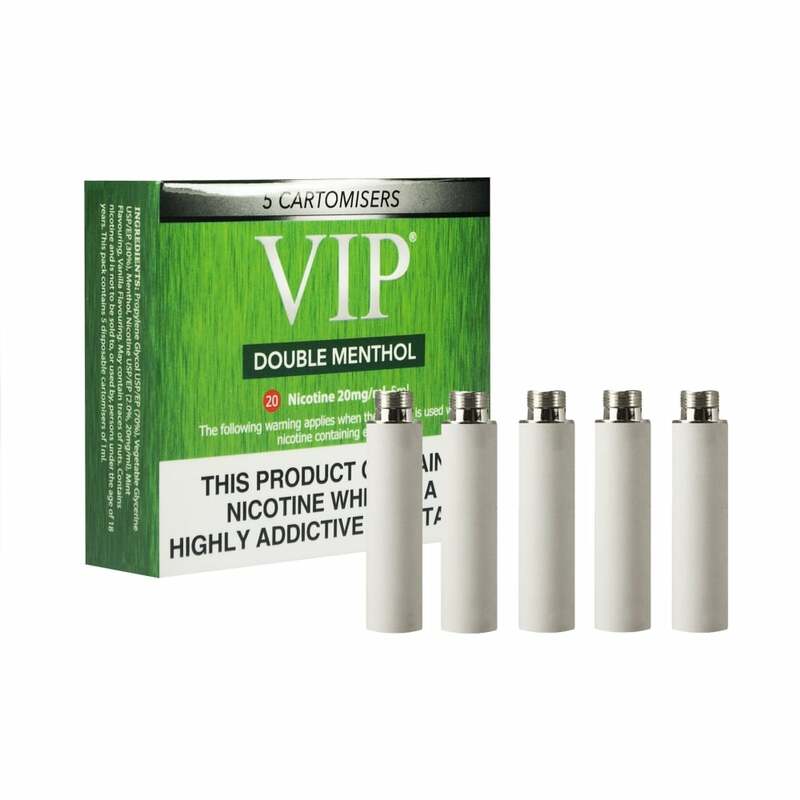 To enjoy the fresh minty flavour of Double Menthol by VIP, simply unscrew your used cartomizer and screw in your Double Menthol Cartomizer Refill. The icy blast of super-strong menthol is paired with sweet mint notes which balance the flavour and give it a true cig-a-like authenticity. Nice strong flavour. Changed to menthol so don’t compare to normal cigarettes. Best on the market for strength and flavour! Excellent menthol taste and they last well. Great product which arrived on time. I like them, the menthol is not too sweet, and lasts longer than previous cartomizer. Nice cool taste with a very good nicotine hit. Excellent product. Helped me give up smoking 7 years ago. Fast delivery and great service. Excellent quality. Nice fresh taste. Double Menthol flavour? you are kidding me!! I tried the 16 mg and they were just sweet, almost vanilla in flavour. I then tried the 20mg and the same. Absolute rubbish. Not a hint of mint. NEW STOCK IS NOT AS GOOD AS PREVIOUS BOUGHT.TOWARDS END OF REFILL YOU GET A BURNING SENSATION IN THROAT. great product! very easy to use & at a reasonable price! smooth in taste & just like real cigarettes which help the craving massively. i have tried other products but have decided that VIP brand is the best to sit my taste. Delivery was quick too which is a bonus! Have used these for the past year as was a smoker and used the menthol range, I would recommend these VIP cartridges they are easy to use and certainly give the kick you need.